Upon arrival in Bangkok, be transferred to the hotel. 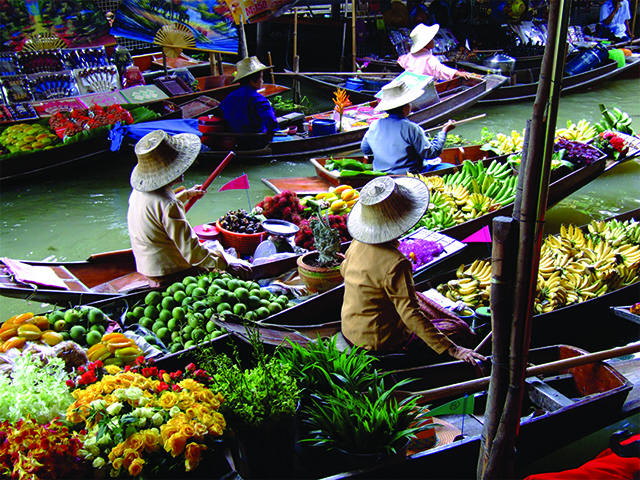 The rest of the day is free at leisure for you to explore Thailand, a land of myriad offerings. This tropical country is known the world over, for its Buddhist temples abounding in rich history and culture, white-sandy beaches, delectable Thai cuisine, silvery waterfalls and green vistas. On this holiday, explore this and much more. Post breakfast; be met by your guide before heading off to Wat Pho. Wat Pho is the temple of the reclining Buddha. 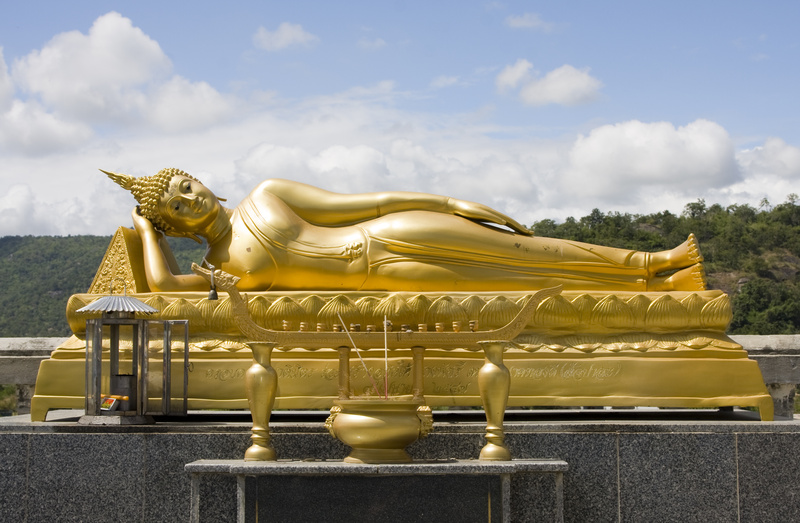 This iconic temple is the abode of a 43-meter long reclining Buddha. This temple is one of Bangkok’s oldest and largest temples. Later, visit the revered Lak Muang – Bangkok’s City Pillar. Up next, proceed to the Grand Palace, in this vast complex; you can visit the Temple of the Emerald Buddha (Wat Phra Kaew). This temple is considered as the most sacred temple in Thailand. Enjoy lunch at a riverside restaurant before you embark a long-tail boat to explore Bangkok’s maze of canals and waterways, locally known as Klong. This ride will give you an insight into the traditional Thai life. 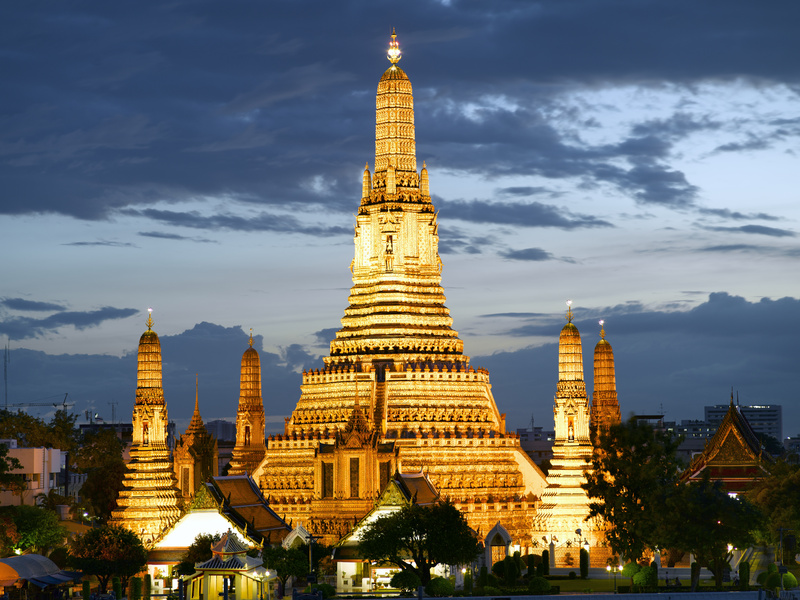 End the day by visiting the Temple of Dawn-Wat Arun. Post breakfast, you will be met by your guide and transferred to Don Muang Airport for your flight to Chiang Mai (Cost not included). Upon arrival, be met by your guide and be transferred to the hotel. The rest of the day is at leisure, for you to explore this historic and vibrant city. Start your day with a picturesque drive through the agricultural countryside of Thailand to reach Elephant Nature Park. The Elephant Nature Park is a sanctuary for rescued elephants. This rehabilitation and rescue centre visit is a highly recommended. You can learn about personal stories of the rescued elephants from the experts. Spend the whole day among these magnificent mammals. You can feed the elephants with fruits from the viewing platform. After a scrumptious buffet lunch, walk to the river that skirts the park for bathing the elephant. Here you can learn how to safely and properly bathe an elephant, and you can also help scrub these giants as they splash around. Alternatively, you can stay dry on the sandy shore and watch the elephants bathe and play in the water. At around 5: 00 PM bid goodbye to the elephants and to Elephant Nature Park before the hour-long drive back to your hotel in Chiang Mai. The first stop for the day is the local market at Mae Malai. Your guide will show you around and explain about the herbs and vegetables used in Thai cooking. Later, proceed to Chiang Dao. Later, proceed to Chiang Dao to explore the rustic countryside. Also, visit the Palong Tribal village for an opportunity to meet the Palong people, and see the women don their traditional attire. Up next, set out on a beautiful walk through the jungle. We walk up, but not too steep until you reach the top of a ridge offering spectacular views of the limestone mountains and of Doi Luang Chiang Dao, the third highest mountain in Thailand. Later, descend through agricultural lands to another Palong village for a simple lunch. In this village, visit the local school and from here you can either walk or drive to a Karen village. On the way back to Chiang Mai, stop en route at an Orchid Garden / Butterfly Garden. After breakfast, be met by your guide and be transferred to Chiang Mai Airport for your flight to Phuket (Cost not included). Upon arrival, you will be met by your guide and be transferred to the hotel. The rest of a day is at leisure. Optionally, you can choose to go on a Phuket Old Town Discovery Walk (Cost not included). This Discovery Walk is all about learning the authentic local lifestyle. On this walk, go to a local shrine, visit the oldest herb shop in town, learn about traditional herbal medicine. This walk will also take you along the historic Chinese shophouses in the beautiful streets of Thalang and Soi Romanee. Today the day is at leisure for you to explore Phuket. Phuket is Thailand’s largest island and offers a plethora of water based activities. Optionally, you can go on an Island Hopping excursion and visit the Similan Island by Speed Boat (Cost not included). For this optional expedition, be picked up early in the morning from the hotel and be transferred to the Jack Similan pier where some hot drinks await. From here, depart in a shared speedboat to Similan Marine National Park, where you can go snorkelling in the azure waters at Bangu Island. After a nice lunch on another island, continue to the next snorkelling destination: Payu Island. In the late afternoon, return to the Jack Similan pier and be transferred to your hotel. Today is at leisure. Optionally, you can choose to go on a Phang Nga Bay Sea Canoe tour (Cost not included). Phang Nga Bay Sea Canoe: Depart from Phuket at midday and enjoy the breathtaking scenery of Phang Nga. After a light lunch onboard, set out on your canoe to explore Phang Nga Bay which is a shallow bay in the Strait of Malacca between the island of Phuket and the mainland of the Malay peninsula. This region is famous for its limestone cliffs, sea caves, coral reefs, stalactite rocks, pristine environment, unique wildlife and much more. Spend the afternoon exploring the bay and discover this unrivalled region. Once you are back on board, enjoy dinner as you savour a stunning sunset over Phang Nga Bay. In the evening, once darkness falls, Hong by Starlight tour commences. You can make a traditional lotus-shaped floating vessel made of Banana leaves, colloquially known as the Krathong. This beautifully decorated floral handicraft is usually floated during the traditional festival of Loy Krathong. But today, you get a chance to make one! Here you can have your star-struck moment and witness the bioluminescent plankton, a one-of-a-kind experience which is also highly recommended. Disembark and be transferred to your hotel. Post breakfast, you'll be transferred to the airport as your journey ends today.